It is said that the only time you need to worry about a Grippli is when you cannot see them. 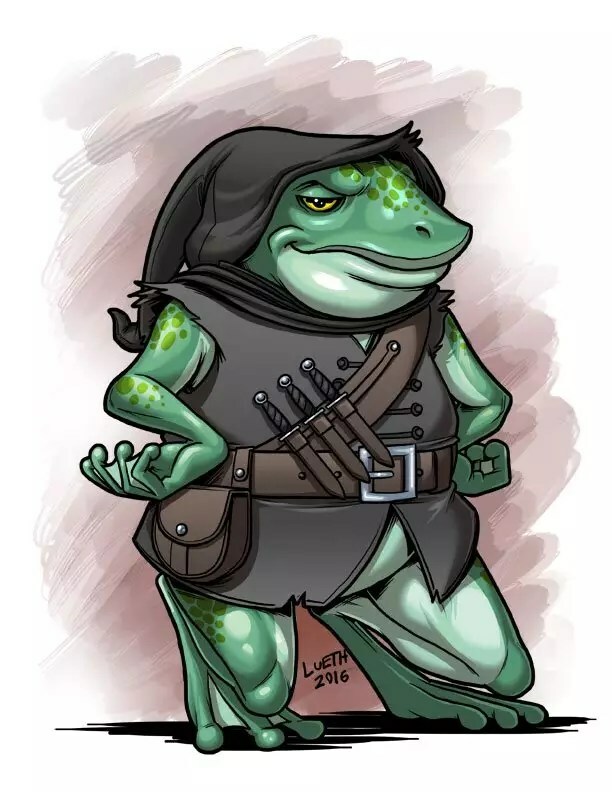 Little is known of this frog-like race except that if you need someone killed, you cannot go wrong hiring a Grippli. They’re skills in stealth, poisonous nature, loyalty to their word, and connection to Teltos – the collector of the dead – has made their reputation as assassins known far and wide. Like many of his people, “Billius” set out on a mission, one that he believed would have him set for life. To do this he had to infiltrate a crew of adventurers. But his time with them has proved to have a different effect on his life than he had planned. The island of Dawon is the home of the catfolk. A savage, predatory, and self-important people. Their Island God Palug is the God of the Hunt. The catfolk’s entire culture is based on the yearly hunt which determines its peoples’ status for the coming year. In the afterlife, it is believed that those who are worthy will be given vast jungles with worthy prey to hunt down for all eternity. But that is not a fate sought by all the residence. 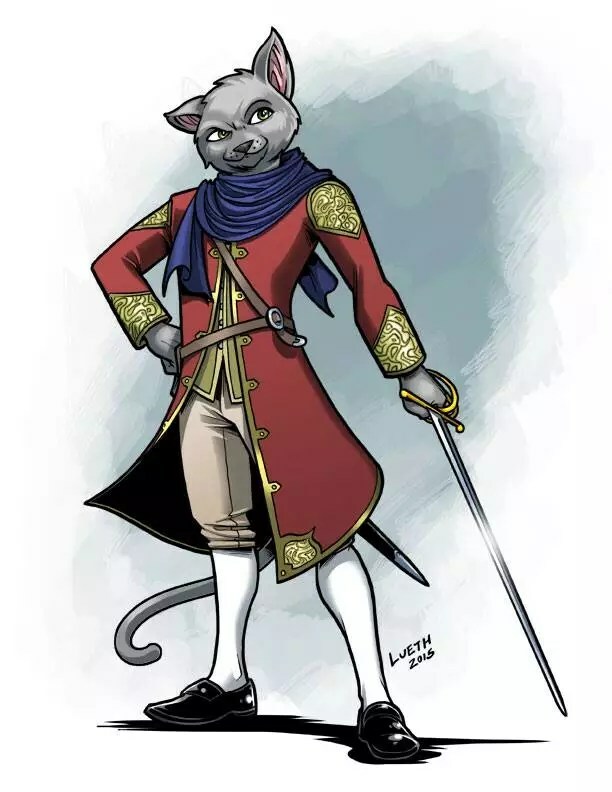 Every now and then a catfolk is born who craves a different kind of hunt. Marius is one such catfolk. Instead of stalking through forests Marius prefers libraries and tombs, instead of herbivores, he hunts knowledge. Not wanting the afterlife promised him, Marius struck out into the world to chase the obscure and unknown. I am born of salt and star. Reared to hunt the whale, the shark, the seal–to snare redfin, crab, langosta and pearl from the oyster’s shell. I learned to sail before my first step. You are born and will die on an island, but we are born and live upon seas. We have no lands, no gods, no lords. Who sails, has value. Who builds, and sails where they want. You may call me Salt. To learn my name is to know I am Free. Left on the island Althorn with the monks of Korada by the Astral Deva Senal. 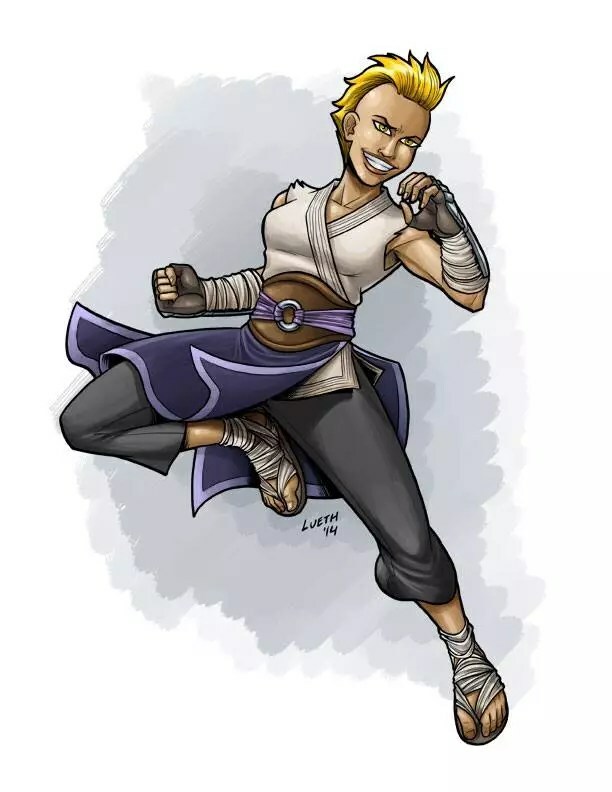 Seiza grew up with the monks who trained her in the martial arts, how to focus her chi and the teachings of Korada on self-enlightenment through meditation. They succeed on all but the latter. Seiza was to free of spirit to learn the monks’ final lessons. After an incident with fellow student Sozen, the decision was made that Seiza could not learn the final lessons in a traditional manner and was instead sent to search to oceans for her own style of enlightenment. The elves are a mysterious race. So rare are they seen that they are often believed to be anything more then a myth. But they are real my friends, they are. They live on the island Selphenra and are a proud, noble people, who have learned that they do not need to conquer nature but work with it. They’re desires conflicted with the rest of the Meridine Ocean and caused them to become isolationists on their island plateau. Unfortunately, this has caused them to become sternly set in their ways. But knowledge has a way of surfacing no matter how tall you build your walls. Vianna was curious in the magical arts and showed a natural talent for it. Though it was soon discovered that she did not draw the magics she commanded from the Goddess Toshigami. She heard the secrets of magic whispered through time and discovered how to draw magic from within herself. When a blight started to spread from her house the other elves became outraged and used her in a sacrificial ritual. Sending her out to sea, poisoned and with offerings to the gods. Her spirit guide came to her and managed to keep her alive long enough to be found. 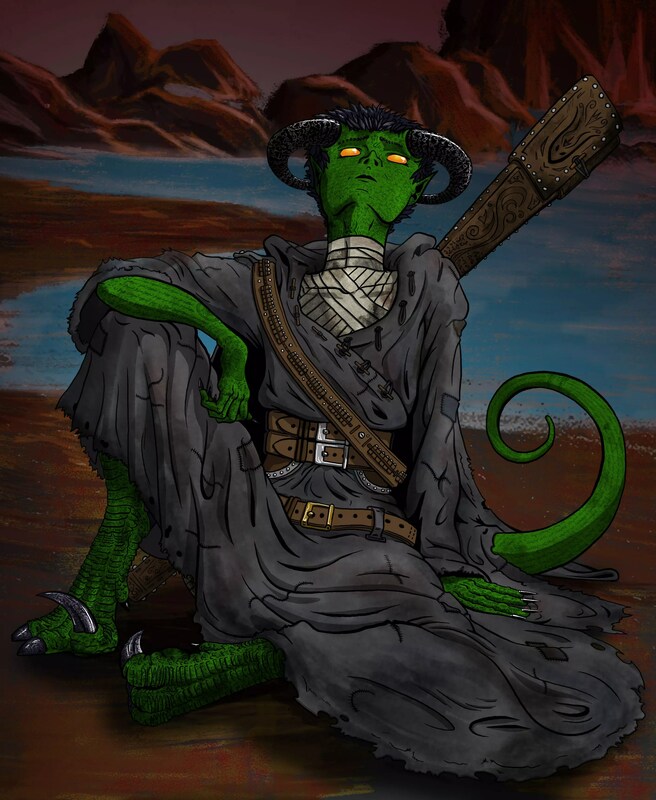 Wendigalia is a tiefling, the only one known in existence. Incredibly intelligent magical engineer, who created a miniaturized cannon and a technique known as “Refiling” on the inside of its barrel. She calls this strange contraption the Gangarish, colloquially known as a Gan by anyone disrespectful enough to not use its full name. Her devilish heritage grew to valuable to others. She was captured at the tender age of twelve by the Mages’ Guild. For 16 long years she was tortured and experimented upon. Fate has a way of intervening with those strong of spirit. After many escape attempts, she finally spotted one that would change her life forever. Fulther – Father of the Gods. 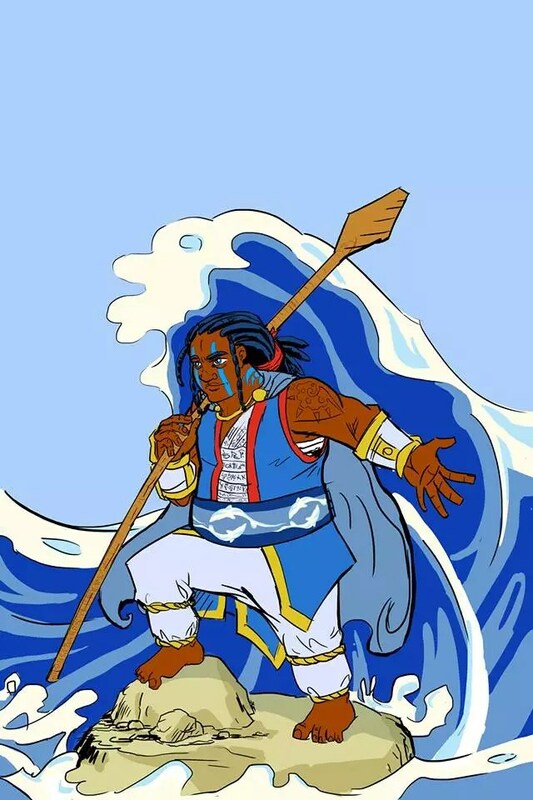 God of the oceans. Kava – Mother of the Gods. Goddess of the heavens, beauty, desire, destiny, and home. Allmid – Sister of Kava. Goddess of freshwater and life. Possible Colossi? Tulmo – Sister Goddess of Fulther. Goddess of Winds and travel. Vinrus – Brother of Fulther. God of volcanoes, earth, fire, life cycle, and time. Demis – Brother of Fulther. Keeper of the dead inside the Void Ocean. Strin – Brother of Fulther. God of War and storms. Teltos – Son of Demis and Allmid. The collector of the dead. Salna – Daughter of Fulther and Kava. Goddess of celebration. Represents the Year cycle moon. Wimby – Daughter of Fulther and Allmid. Goddess of Life and Crops. Represents the Month cycle moon. Rowaa – Daughter of Fulther and Salna. Goddess of the arts. Represents the Day cycle moon. Ulth-to – God of trade. Resides on the island Aurixia. Often depicted as a very rotund human male made of gold, covered in silks and jewels and a jolly expression on his face. Korada – God of tranquility. Resides on the island Althorn. Often depicted as a simple middle-aged human male in robes with a neutral face, eyes closed and a relaxed yet confident stance. Toshigami – Goddess of the Forest and of the Elves. Resides on the island Selphinra. 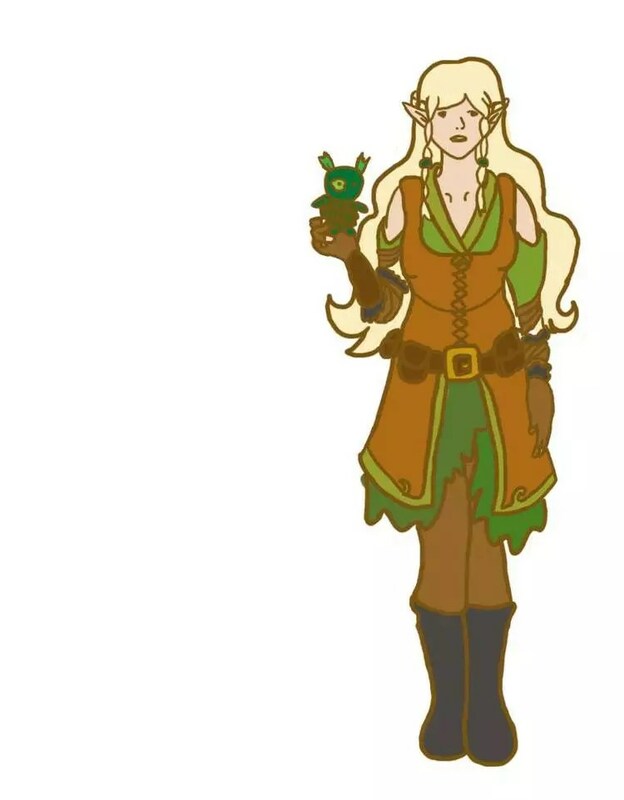 Often depicted as a 7 foot tall elven woman made of plants who’s movements resemble that of trees gently swaying in the breeze. Cetaceal – Goddess of the Thalassic named Theodore (A behemoth whale with crab like arms instead of fins). She rules over the subaquatic race known as Gilmen, a humanoid shape strong resembling humans but often shorter, gills around the neck, webbed hands and feet. Cetaceal is often depicted in the style of a merfolk but with all her skin and lower half resembling an orca. Palug – God of the hunt. Resides on the Island of Dawon and oversees the Catfolk. Palug is often on the hunt looking for his next worthy prey which has created large fearsome beasts that roam the jungle of Dawon. He is often depicted as a smoky visage of a black panther who stands at about 20 at his shoulders when on all fours. There is much debate if Palug is actually intelligent or not. Contan – Colossi of Fire. Imprisoned in the sky as the Sun, guarded by Bahn. Demia – Colossi of Earth. Imprisoned on the ocean floor. Drown by Fulther, guarded by Demis. Gignum – Colossi of the Savage. Creator of the Gignum Trees. Trees with a core so dense and strong, the Catfolk uses it instead of metal for their tools. The Colossi used to rule the world, they could deny mortals whatever they wished purely on a whim, depriving people of water, air, fertile earth, and so on. They created the lesser races and enslaved them to serve their will. After thousands of years, one man, a servant of Siya, the Colossi above all, saw that Siya used a chest that contains magic itself to control all things. Siya told this man not to touch the power because mortals couldn’t possibly handle such magic and would cause great evils to sprout and come forth and the end of the world would become neigh. The man watched Siya each time he used this power and studied how it was manipulated. Years went by until one day Siya closed the magic chest but forgot to lock it, so the man waited till he believed Siya was asleep and snuck off and opened the chest of magic. Magic spewed forth! The massive surge of energy awoke Siya who rushed to stop the man! He saw the man taking control of the magic and became furious. He tried to wrestle control away from the man, but the man had taken control of too much. With Siya’s options quickly fading he lashed out and tainted the magic he still controlled! The man kept pulling in what magic he could and started to become sick with the taint. He focused the magic that had been corrupted and used it against Siya. The magic melted Siya into the black water which threatened to destroy all things. For a moment the man feared Siya had been correct and the end of the world would soon be upon them, but with some quick thinking, the man was able to push the tainted magic away to the edge of his newly claimed realm. This man came to be known as Fulther, Father of all Gods. The tainted magic and the Colossi Siya became the Void Ocean. Fulther split his magic with his brothers and sisters, creating the Gods as we know them. They took their battle to the rest of the Colossi, who had relied on Siya for their power and were, therefore, no match for the Gods. Although the Colossi could never truly be killed, Fulther imprisoned them away to keep them from ever being able to exert their wills upon the races. The Void Ocean is composed of liquefied remains of Siya, the original Colossi, and encompasses the Meridine Ocean (where our story takes place). The Void Ocean got its name because of its sheen black surface. It is said that the Void Ocean is where Demis imprisons the dead who do no deserve to be reborn. Those who have dared to travel the Void Ocean and make it back alive tell tales of horrors, leviathans larger then islands, undead who swarm ships, and even Demis or Mortos driving crews insane or worse. Despite the danger those brave enough, or stupid enough, to try and traverse its tides, are drawn by tales of vast riches, divine lands, unimaginable powers, or just trying to achieve some level of fame. There exists only one tale 400 years ago of a man who has made it to the other side and back, though even his stories are obscure and lost to time. His name is Iluvia. Little is known about Iluvia to the general public. Most of his records have been destroyed or lie heavily encrypted. Those who have the wherewithal to dig deep enough can find mentions of his adventurous exploits and his founding of what has become the Mage Guild. It is also said that he opened trade between the races allowing for peaceful travel between islands, mostly.